With over 25 years of tight and awkward situations. We get the job done right, weather it be footings or landscaping Bliss excavations Central Coast gets the job done right. We are the tight access specilists in excavation work. 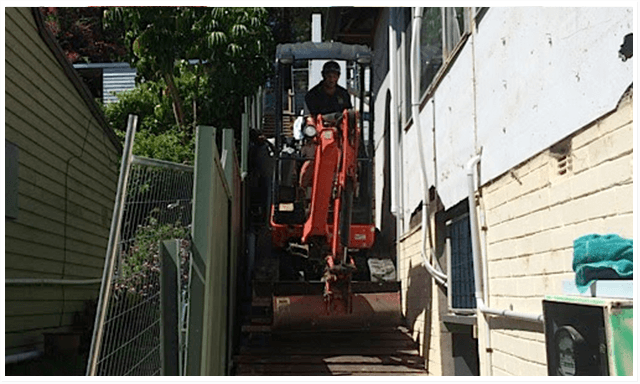 Weather its a narrow foot path or working through a back door trust the excavator professionals located on the Central Coast. For a no obligation free quote contact Bliss excavations today. With a proven experience in tight excavation situations around the Central Coast. You can trust the professionals. Bliss Excavations located on the Central Coast specialise in excavator work in difficult and tight access areas, under house and narrow access pathways. No excavator job is too hard. Call the professionals today. I was very happy with Phil from Bliss. He is a very patient man who takes the work very seriously. He was well prepared for the job and had it finished in no time. Phil has been both prompt and highly professional. He is a very pleasant individual to work and is only to willing to meet your needs. Has completed and excellent job at a reasonable and extremely competitive price. I have no hesitation in recommending him.